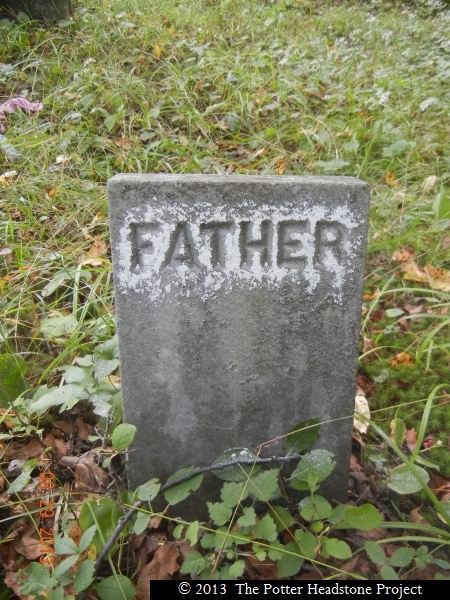 There is only 1 headstone in this cemetery. Located on private property in Clara Twp. There are currently 1 records in this cemetery. Fosmer Ira December 29, 1819 March 07, 1892 Lydia Lyman "Rest in peace"
IRA FOSMER, farmer, P. 0. Clara, is a native of Onondaga county, N. Y., born December 29, 1819. He attended the schools of his native county until thirteen years of age, and in 1832 his parents moved to Hinsdale, N. Y., and from there in 1833 to Potter county, Penn., settling on the farm in Clara township, where he now lives, which is one of the best farms in the township. Mr Former was married, January 8, 1846, to Miss Lydia Lyman, and they have five children: Foster, Flora, Freeman, Nettie and Jackson. Mr. Fosmer is a member of the Masonic fraternity, Macedonia Lodge, No. 258, at Bolivar, N. Y. He has held various official positions in his township, taking an active interest in public affairs. 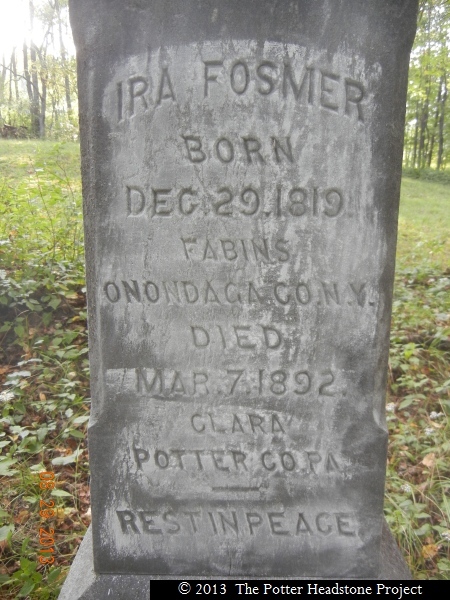 Garet Fosmer, father of Ira Fosmer, was born in the State of Connecticut, July 23, 1796, and died in Clara township, Potter Co., Penn., January 23, 1868. He married, in 1818, Miss Lovina Skelenger, of Onondaga county, N. Y. John Lyman, the father of Mrs. Lydia Fosmer, was born at Lake George, N. Y., July 7, 1789, and died in 1882 in Eulalia township, Potter Co., Penn., having lived the greater part of his life in Roulette township, and married for his first wife a Miss Lucretia Palmer.